The Wetterhoun is a waterdog that was originally developed to flush out moles, polecats, otters and other game for the waiting hunter. It can also be trained to retrieve from both land and water and in the past was used as a farm guard dog. This breed is fairly rare today and seldom seen outside its homeland. Favored by farmers, the Wetterhoun was developed in the northwest corner of Holland known as Frisian. 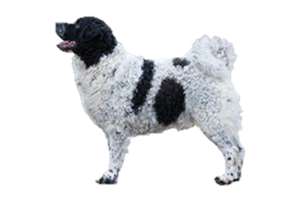 It is believed to have been created by crosses from existing farm dogs, water spaniels and spitz breeds from the north. It is closly related to another breed from this region, the Stabyhound. Is the Wetterhoun Right for You?